This is a recent find and though I am still finishing up the Gypsy Grandma, I couldn't walk away from this challenge. 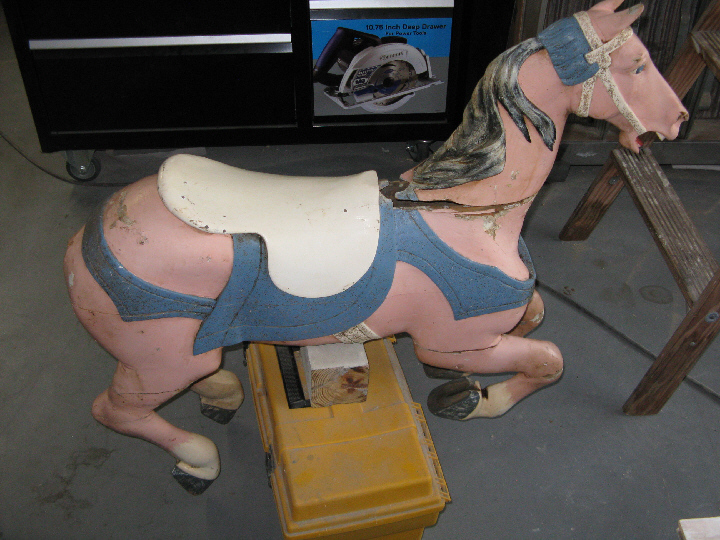 It's a small horse, most likely a inner horse or from a children's merry-go-round. I have a friend that has a large collection of carousel carvings and he helped determine it's age and the likely carving studio in Brooklyn that made it. 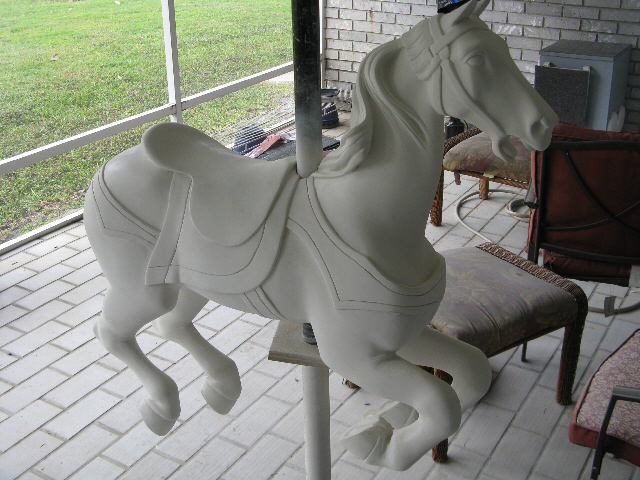 The head which is solid , was only attached to the horse by a nail and a screw..barely. 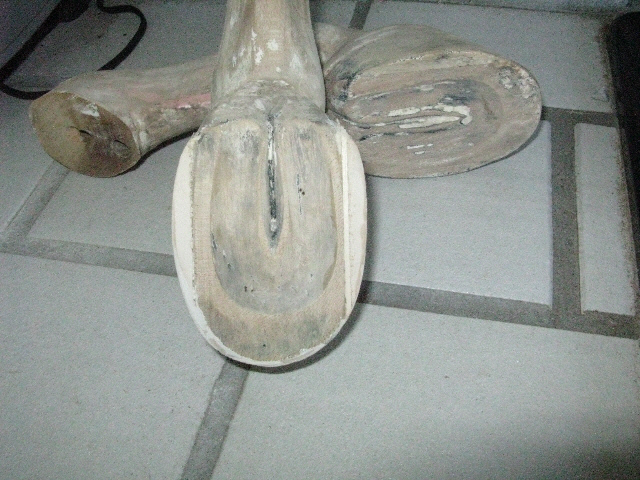 Three of the 4 legs have all joints loose. These will be removed, repairs made then re-installed using dowels. The paint is known as park paint. It is not the original paint or color and will be totally removed. 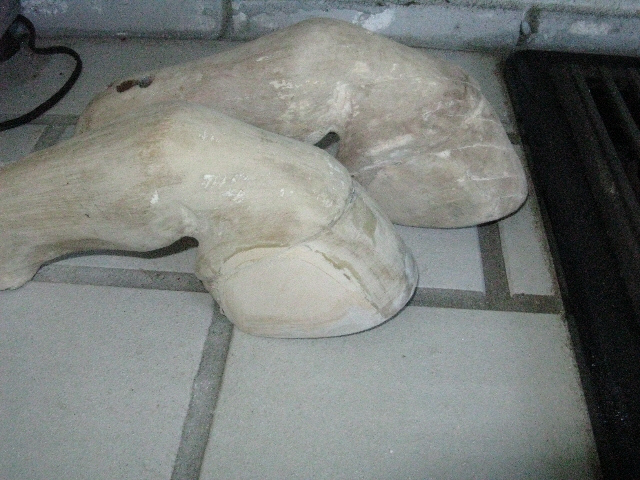 The back legs are in such bad shape, though not obvious in this photo, they have been braced by steel brackets on the inside of each leg. 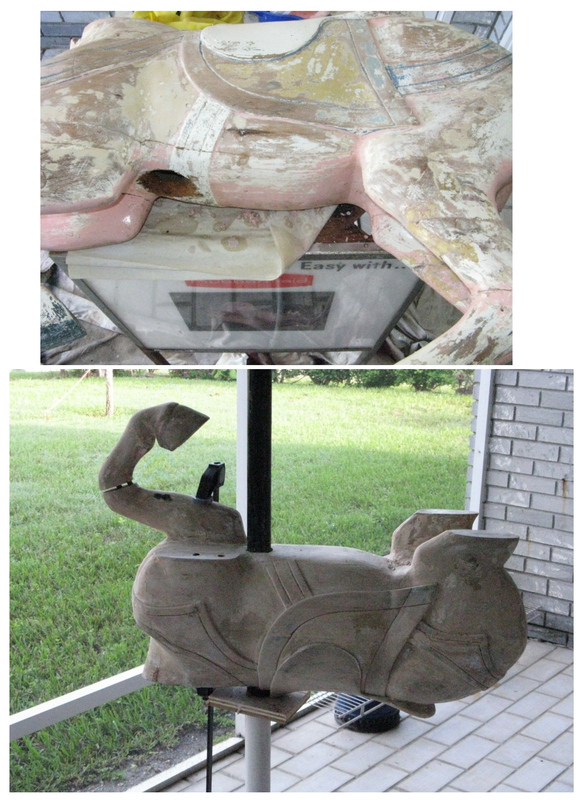 These photos show some of the condition issues and previous repairs made in an attempt to keep it together and working. 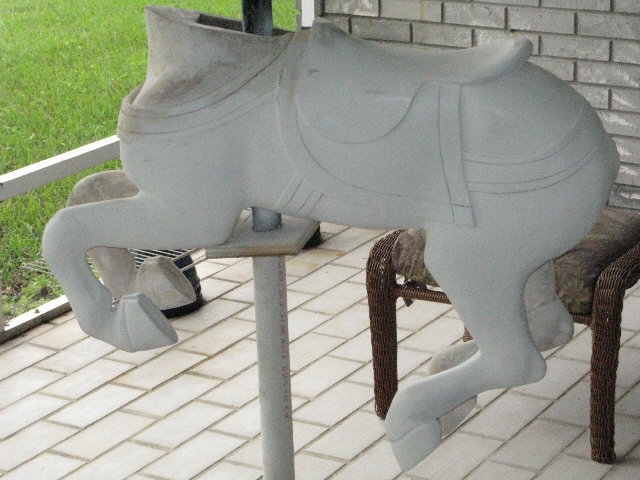 I removed about 40 nails and screws added to the horse over the years. When it was created only dowels were used with glue to hold it together. 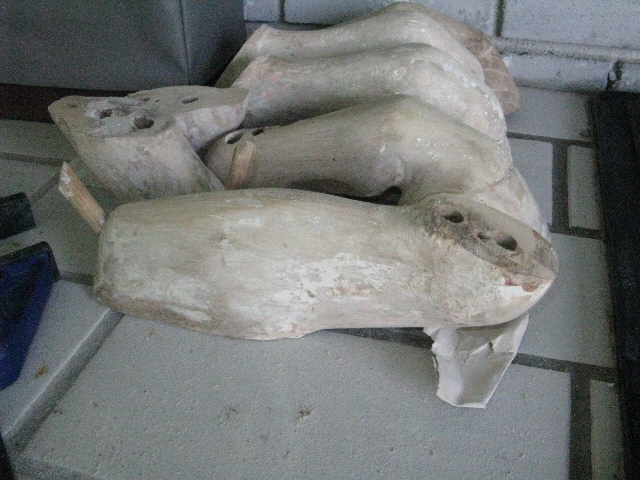 Some parts of this are in such poor shape that new carved parts may be needed. New basswood will be added and carved to replace missing or damaged wood. The neck area was damaged badly because the previous owner(s) drove a huge nail through the head into the body shattering the wood in that area. was just floating in the air and did no damage to the body. 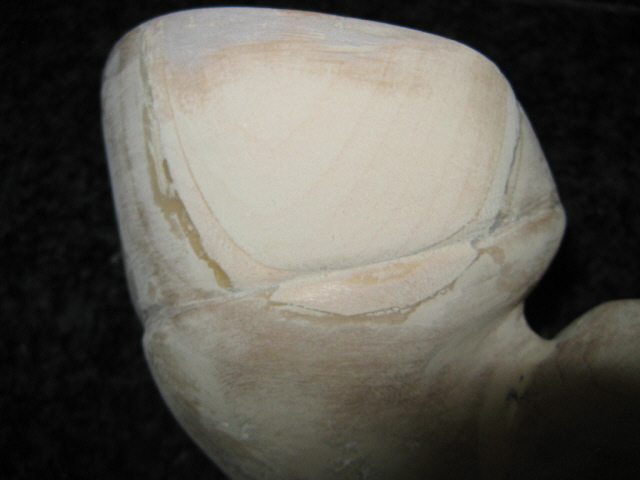 Originally the head was only glued in place. I will add dowels to help secure it. Shown from the bottom, to get the correct thickness needed on one side 2 pieces of basswood sheets were glued then carved. The legs have been re-assembled, new dowels installed at all joints and they have been glued and doweled back to the body. Though it's looking much better, still a long way to go. 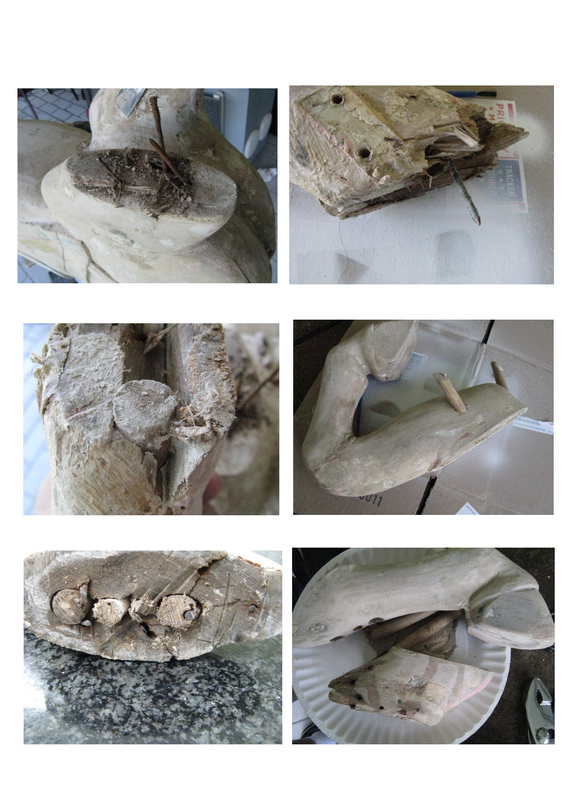 When the head is ready for re-installation, it will have dowels installed to help secure it better to the body. Below it is all together.... still more sanding. Other than some final sanding, it's ready for the color to be added. However that will be delayed a bit. Another project surfaced and will take priority for a time.